With experience in atmospheric modeling and research, Altostratus Inc. has successfully and cost-effectively completed numerous projects for federal, state, local, and other agencies consistently ahead of schedule and on or under budget. Altostratus Inc. also has a record of successful completion of projects that advance the consideration of scientific concepts, RD&D products, and control measures in the research and regulatory environments. Please scroll down to the end of this page for a description of services -- also see Dr. Haider Taha's experience in the page "About Us". Altostratus' work and various projects in meteorological, emissions, and photochemical modeling led to the consideration by and support from US EPA, AQMDs, cities, and local governments of the “Cool Cities” family of measures to reduce urban heat, improve air quality, and reduce cooling energy use. Altostratus has completed projects to quantify the benefits of surface modification measures (e.g., cool roofs, cool pavements, solar PV, and urban forests, among others) some of which were considered in clean-air plans, such the Bay Area and South Coast AQMDs. Altostratus also completed a regulatory atmospheric modeling project to develop an urban-forest control measure for the ozone State Implementation Plan of the Sacramento region. It also completed a project for the Cal/EPA in which it developed a first-of-its-kind Urban Heat Island Index for the state of California. See the projects page for more information or contact us for details. Computational resources at Altostratus Inc. include multi-processor, high-performance Linux platforms fully dedicated to atmospheric modeling, research, and analysis. Models are continuously maintained, updated, and optimized for various applications. Software needed in data processing, visualization, and statistical analysis are fully configured. Most recent meteorological and surface input datasets are tested, enhanced, and improved , and new data frequently acquired for more accurate modeling at various scales. Development and update of prognostic models and tools for use in urban / environmental planning, sustainable development, urban heat-island studies, and evaluation of mitigation or control measures under present-day conditions, future-year emissions, and future-climate scenarios. Highly site-specific, fine-resolution short- and long-term weather / micrometeorological forecasts are tailored specifically to the needs of the client's industry and application (examples include AERMOD dispersion modeling, LEED-credit weather modeling, agriculture, health, water usage, emissions, transport, energy, or siting of monitors for AB 617 compliance in California). The meteorological models are configured and customized for the specifics of each site, including fine-scale characterizations of land cover, morphology/topography, surface and soil properties, surrounding areas (especially upwind), local sources of heat, and geometrical features. These characterizations are based on site visits, remote-sensing, and aerial imagery among other sources of information. Models are tested to ensure satisfactory performance. Suitable model physics and parameterizations are customized and adapted specifically for each site. Observational data are ingested and assimilated in real time as needed. Advanced, fine-resolution meteorological modeling at Altostratus (mod-uWRF, mod-uMM5) is carried out to create probabilistic fine-resolution, site-specific weather (weather files) for current and future climates as input to building energy analysis models such as DOE-2 and EnergyPlus. For future climates, Altostratus' approach of generating weather files takes into account not only the changing atmospheric fields (via dynamical downscaling of climate models), but also the changes in land use and land cover that are expected to occur, including urbanization and modifications to surface physical properties. For both current and future climates, this approach is a significant improvement over the traditional use of coarse-scale weather files (e.g., TMY, TRY, WYEC, etc.) and coarse climate zoning in building energy analysis. Such data, based mostly on reanalysis or airport weather, are seldom representative of the conditions at the site of interest. For current climates, Altostratus models also ingest observational meteorological data from weather stations in the area (e.g., mesonets) along with detailed characterizations of land cover and urban morphology. Using model-generated site-specific weather (for any desired time period and span) can significantly improve the accuracy of quantifying building energy use throughout the design and operation phases and in complying with codes (e.g., Title 24). Contact us for more information. In addition to the research- and regulatory-grade meteorological, emissions, and air-quality modeling capabilities at Altostratus Inc. discussed elsewhere on this website, extended capabilities are developed for fine-scale urban meteorological and air-quality forecasting (sub-kilometer resolutions). Building upon updated urban canopy-layer parameterizations, the models' days-out forecasts are evaluated on an on-going basis. In relation to this effort, the parameters input to the models are also updated to provide area-specific information. 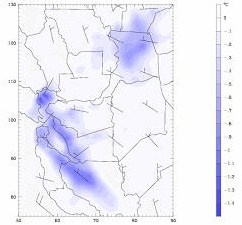 To improve the accuracy and spatio-temporal resolution of characterizing source emissions, transport, and fate of air contaminants in urban areas, Gaussian plume dispersion models are linked with fully dynamical micro- and meso-scale meteorological models to provide real-time local drivers to dispersion calculations. These capabilities can also be used to generate site-specific, fine-resolution meteorological input to regulatory-type dispersion modeling of new or modified sources to demonstrate compliance, e.g., with EPA-recommended models like AERMOD.